Exclusive! Dainty butterflies hover on lacy, white panels that let the sunshine filter through for a light, airy look. The scalloped hem adds a pretty detail. 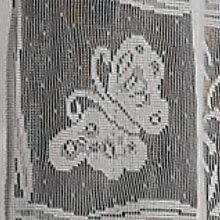 Our Butterfly Lace Panels are easy-care polyester with rod-pocket top. Machine wash. Imported. 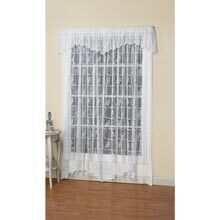 56"w. To get the look pictured, order 2 Valances and 2 Panels - each panel sold separately. I have a large window in my shower & needed something to blur the view outside yet allow light in. 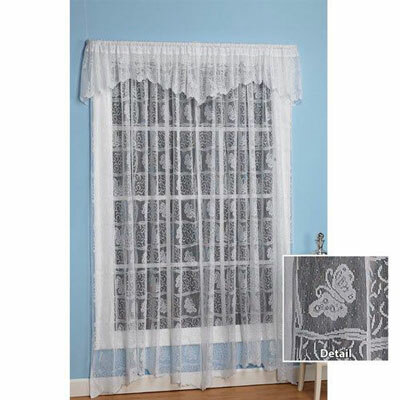 Not only did these light weight curtains work perfect, they are also so beautiful that when the shower is not in use I seldom pull the shower curtain closed. Thinking of getting a set for my kitchen window!Love them! Really happy with quality, design, and fit. Good buy! "I love butterflies. These panels were great for the price. I love, love them."